Letter from Corbin Shell on his LOOOONG range .17. Check out this target. I am a highpower shooter who mostly shoots longrange (600, 1000 and Palma-8,9,1000yds with iron sights .308 only and 155gr bullets) My thoughts were to build a rifle that would make me pay more attention to the wind which would in theory should make me a better wind reader. While shooting a friends .17, I saw the accuracy potential. All things considered(wind drift, bullet quality, barrels etc) I decided to build a dedicated 600yard rifle to hone my wind reading skills. I am guessing that the velocity is about 3800fps. John built a switch barrel for a friend and this load chronographed 3800 in his rifle. There are several things that John did which I feel are needed for a switch barrel. Most noted is the removal of the Nesika recoil lug. Slots were machined in the bottom of the receiver to serve as the recoil lug. Keep in mind this is a switch barrel and will be used as a Palma rifle (.308win-155gr bullets). 500pc of brass were ordered. Brass prep included trimming, chamfering, deburring the neck and deburring the flash hole. Thats it. I did NOT cull by weight or neck turn. After measuring about 50pc of FACTORY loaded ammo and 25pc of the new brass a reamer was ordered. Dave Manson ground two reamers. One for 25 & 30gr bullets and the other for the 37gr bullets. Almost all the brass measured .1935-.194" neck diameter. The reamer was cut with a .197" neck. A little tighter than SAMMI and would still fire ANY factory ammo. Body dimensions were cut to minimum dimensions. When the rifle was complete I broke in each barrel. Both tubes only took about 10 rounds. Shoot one and clean for a day or so until all the copper was gone. Now the fun begins!!!!!!!!!!!!!!!!!! Lets go shooting. I zeroed the 9 twist barrel on some little cups of water at about 60 yards. EXPLOSIVE to say the least. The following week I went to one of our across the course matches at Butner NC. The rifle was zeroed at 200yards on the standard highpower target. Spun on 10min of elevation and went back to 600yards. I got a good elevation zero and that was that. Two weeks later Oak Ridge was hosting the Tenn State Longrange match. Friday May 4th was a practice day. I brought along the little "toy" as some call the rifle. What better time to try it out. Firing began at the 600yard line. The course of fire is 2 sighters and 20 shots for record. Calm and hazy conditions. The flags were still for the most part. No wind on the scope, elevation on zero. I loaded the first round then bang. PINWHEEL X. DEAD CENTER!!!!!!!!!!!!!!!!!!!!!!!!!!!!!!!!!!!!!!!!!!!!!! Lindsay and Mark Barnes (highpower shooters) were pulling the target and could not believe what had just happened. Mark "The Mighty Barnes" called up on the radio and commanded I "tighten up". Second sighter was a 10 at 12 o'clock. Just 20 more shots to go. Everything was going pretty good as I was shooting better than 50% X's. Then I saw the mirage pick up from the right to left. Not knowing just how much these little pills were going to blow I decided to hold midring 10 at three o'clock. 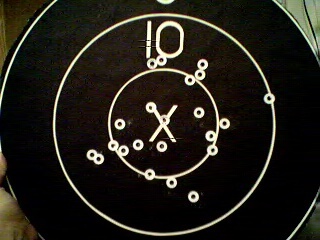 The bullet went wide to the right but still in the ten ring. This left me scratching my head. Oh well the next shot I held center. X . When it was all said and done the official count was 200-11x. Thank goodness we put up an new target center. Several people signed and dated the target including Pete Laberge-US Palma Team captain. There were a lot of people on the line just shaking there heads. "No way" was the general consensus. The fun had only just begun. Next stop the 1000 yard line. I spun on 32min of elevation, windage zero. Bang. The target goes down. Good windage, high at 12 o'clock. Clicked down 2 min, bang the target goes down. Mid ring 9 at 6 o'clock. I shot about six or eight more shots. My group was about 12-15". Everyone on the line could not belive what had just taken place. The bullets were subsonic after about 750-770 yards but still cut paper clean. Not a one keyholed. Sense I started this project one person in particular has stuck in my mind - Todd Kindler. Before starting the project I called Todd and explained what my intentions were and he basically called me a fool. Well the proof is in the pudding and the pudding is on the paper!!!!!!!!!! By the way this was my first attempt shooting the little laser stick at 600yards for a full string of 22 shots. Above is a photo of the 600 yard target. the score was 200-11x. The frist sighter was the pinwheel X and the second sighter was one of the 10's as twelve o'clock. The ten out to the right is INSIDE the line. I saw the wind pick up going from right to left and I held midring 10 at 3 o'clock. Damn if the bullet did not go almost were I was pointing. It rattled me a bit as it did not make sense because I held to the right and the mirage increased from right to left. Oh well it still went into the 10 ring. Look at how close the 10's are around the X ring. Not too bad for a little .172 diameter bullet. Jim you would not belive how many people TOLD me a 17rem would not work at 600yards. Well I guess these people are "Book" shooters. By the way I also shot it at 1000yards. My calculations said the bullet went subsonic at about 750-770yards. It still went thru the target straight and did not keyhole. The come up from 600 to 1000yds was 30.75min. First shot struck paper with 32min of elevation. Everyone on the line was AMAZED!!!!!!!! !